The long-delayed Highway 23 expansion project between Fond du Lac and Plymouth is getting back on track, with preparation of a fourth environmental impact statement underway. Efforts to make improvements on the highway have been underway for several years, due to the high number of crashes that occur on the stretch of road. 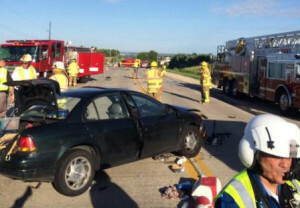 Lawmakers have argued a crash happens on the highway an average of every eight days, while there have been multiple fatal crashes on the busy roadway. However, the work has been held up by a lawsuit filed by the 1,000 Friend of Wisconsin. The environmental group successfully argued in federal court that traffic forecasts used to justify the expansion were flawed, which halted federal support. The recently passed state budget included more than $19 million in state funding to help get the project moving again. Hundreds of people turned out for a meeting Thursday night on the UW-Fond du Lac campus to hear about the future of the project. Fond du Lac County Board Supervisor Dean Will – a former sheriff’s captain who dealt with accidents on the highway – said he wants to see it done right. “If they’re going to do it, do it the right way,” he said. A public hearing on the document will be held next spring and it could be finalized by next summer. Affiliate KFIZ contributed to this report. A hotly contested race for the Republican presidential nomination could lead to Wisconsin’s biggest spring primary turnout in 36 years. Trump is currently leading the GOP delegate count, followed by Texas Sen. Ted Cruz and Ohio Governor John Kasich. Former Secretary of State Hillary Clinton and Vermont Sen. Bernie Sanders continue to compete for the Democratic nomination. Other factors in driving up turnout are the close state Supreme Court race between Justice Rebecca Bradley and Appeals Court Judge JoAnne Kloppenburg, along with thousands of local government, school, and court races. The last time turnout for a presidential primary in the state was above 40 percent was in 1980, when 45 percent of eligible voters showed up at the polls. That number has slid off significantly since then, hitting a low of just 22 percent in 2000. 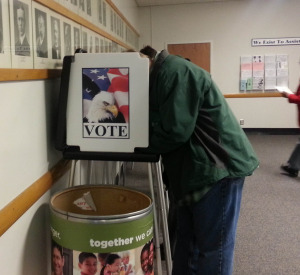 Early voting in Wisconsin got underway Monday, both through in-person absentee and mail requested ballots. It runs through April 1. The GAB is reminding voters that they will need to show a government-issued ID at the polls, such as a driver’s license or state-issued photo ID card, in order to obtain a ballot. The president of the state Senate says she plans to retire from the Legislature at the end of the year. 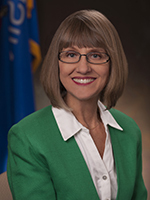 State Senate Republican Mary Lazich (R-New Berlin) announced Monday that she will not seek re-election to another term in the state Senate, ending a legislative career that has spanned the past 24 years. Lazich did not state in her release why she has decided to retire from the Capitol. She started her time in the Legislature in the state Assembly, where she was first elected in 1992. She then won a special election to the state Senate in 1998, where she has served since. She took over as Senate president last year. If Republicans face a contested convention this summer, Governor Scott Walker expects someone other than the front-runner to win the party’s presidential nomination. In the first round of voting at the Republican National Convention in Cleveland this summer, delegates will vote for the candidate they are pledged to support based on individual state results. However, if no candidate has the 1,237 delegates need to win the nomination after that first round, delegates are free to support someone else in later rounds of voting. 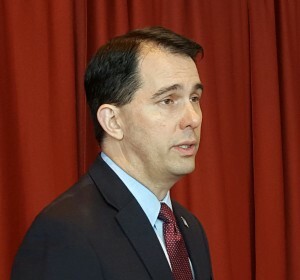 If that happens, Walker expects many will exercise that right to vote for another person. “If the front-runner hasn’t garnered enough votes to get the nomination outright, I think it will be somebody other than that person selected by the delegates,” Walker said during a stop in Eau Claire last week. The current front-runner is Donald Trump – who leads the delegate count, but is still more than 500 short of the nomination. With Trump continuing to win states and the field just recently dwindling to three candidates, Walker said he expects the convention will end up being an open one if current trends continue. Walker, who dropped out of the presidential race himself last fall, has not endorsed anyone and said he’s fine with there being no nominee heading into the convention, since the selection would be a transparent process with the whole world watching. Trump recently predicted there would be riots if he comes close to the delegate count, but is denied the nomination. Walker said he doubts that would happened though. “There are other countries around the world where people are intimidated in how to vote. We shouldn’t be a country where people are intimidated in how to vote, we should vote our choice,” he argued. Affiliate WAYY contributed to this report. Wisconsin voters who don’t want to wait until the April 5 election to cast their ballot can head to the polls starting today. State Government Accountability Board spokesman Reid Magney says in-person absentee voting is now open in clerk’s offices around the state. It will be available in most areas on weekdays through April 1, and is generally offered during normal business hours. Magney suggests checking with your local clerk before heading out to vote, especially in smaller communities and more rural areas where hours may be more limited. Magney says voters should remember a government-issued photo ID card is now required in Wisconsin. He says most people will have an ID card that qualifies, such as driver’s license, state ID card, passport, or military ID. Some student IDs are also valid for voting and a bill signed into law by the governor last week will allow veterans ID cards to be used at polling places. If you have questions about whether an ID is valid, Magney says you can check with the GAB to make sure. 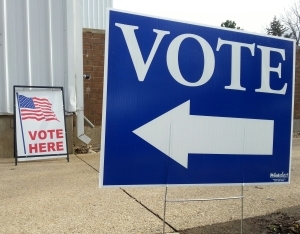 Statewide issues on the ballot include the presidential preference primary and the state Supreme Court race between Justice Rebecca Bradley and Appeals Court Judge JoAnne Kloppenburg. Wisconsin will get its first primary season visit from a presidential candidate next week. Republican presidential hopeful John Kasich has scheduled a town hall for next Wednesday, March 24. The Ohio governor will be at the Crowne Plaza in Wauwatosa, for an event that’s scheduled to start at noon. 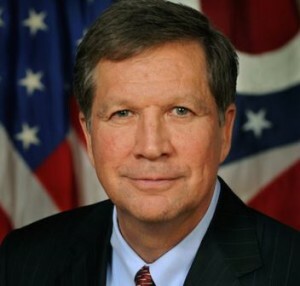 Kasich is the first candidate still in the race from either party to announce a campaign stop in the state this year. Democratic candidate Hillary Clinton’s campaign also announced Friday that her daughter, Chelsea Clinton, will attend events in Madison, Milwaukee, and Waukesha next Thursday, on her mother’s behalf. Wisconsin is likely to see more visits, as the three Republicans and two Democrats seeking their party’s nominations shift their focus to the Badger State, with just weeks to go before the state’s April 5 presidential preference primary. Despite the shrinking field, Governor Scott Walker is still not sure if he will endorse anyone in the presidential race before the state’s primary election next month. The governor said the field became a little clearer after Tuesday’s contests, but no decision has been made yet. 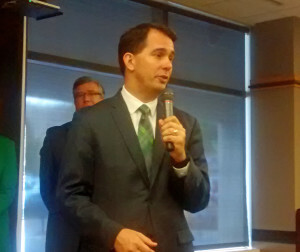 “Clearly sometime between now and the presidential preference primary…I’ll let people know if I’m going to endorse or not,” Walker said during a stop in Green Bay earlier this week. Walker himself dropped out of the race last September. While he did not mention Donald Trump by name at the time, he encouraged other candidates to also exit so the Republican Party could establish another frontrunner in the race. The focus of both party’s presidential candidates is expected to shift towards Wisconsin in the coming weeks. Already, Republican hopeful John Kasich’s campaign announced Friday he will hold a town hall event in Wauwatosa on March 23. No other candidates have officially announced stops in the state yet, ahead of the primary. Affiliate WHBY contributed to this report. Heavy rains and high winds this week have caused a number of problems around the state. While some flood waters have receded, Wisconsin Emergency Management says at least eight rivers continue to have flood warnings in place because of rain that fell earlier this week and melting snow. Major floods are still predicted for the Wisconsin River at Portage, which is expected to crest Saturday at almost 2.5 feet above its flood stage. Portage prison inmates have been making sandbags, and the river is not expected to return within its banks until next Tuesday. The Black River was more than three feet above its flood stage at Black River Falls this morning, although only minor flooding is predicted. 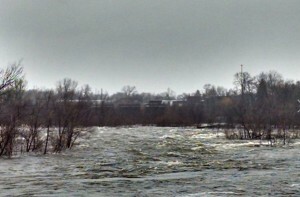 The National Weather Service has added the Wolf River in Waupaca and Outagamie counties to the list of warnings it put out Thursday. Similar warnings remain in effect on parts of the Fox, Yellow, Eau Claire, and Chippewa Rivers. State officials say there have been numerous reports of trees downed and road washouts throughout the state this week. WEM is advising people who come across a flooded road to turn around and find another route. The state and doctors will have new tools to help fight opiate addictions statewide, under a series of bill signed into law by Governor Scott Walker. The governor signed eight bills Thursday, during a series of stops at health clinics around the state. Several of the measures target the state’s heroin epidemic by going after a common starting point for an addiction – prescription drug abuse. “All too often, people who get addicted to heroin start out early and they start out with prescription drugs,” Walker said following a bill signing in Wausau. The package of bills include requiring doctors to check a statewide database of prescription narcotics before prescribing those medications, shorten the reporting period for updating that database, and require pain management clinics to seek state certification. Another measure would criminalize the use or creation of ways to cheat a drug test. The proposals were part of the HOPE Agenda, an effort championed by state Rep. John Nygren (R-Marinette). The Marinette Republican has led a multi-session crusade to combat heroin abuse in the state that was inspired by his own daughter’s struggles with the drug. He called the bills signed Thursday an important step in changing the dialogue about addiction, by focusing on a problem that sparks nearly 80 percent of opiate addictions. “Rather than addiction being a moral failing, we need to understand that this is a medical issue…that it is truly a disease that we can attack and we can win,” Nygren said. Walker signed the bills at healthcare facilities in Marinette, Wausau, Eau Claire, and Oconomowoc. Affiliates WSAU and WAYY contributed to this report. Based on the politics surrounding the current vacancy on the U.S. Supreme Court, a UW-Madison political scientist says he was surprised by the nominee President Barack Obama went with for the seat. 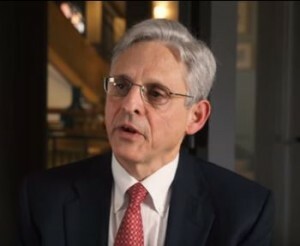 The President on Wednesday named federal appeals court judge Merrick Garland to fill the opening left by the death of former Justice Antonin Scalia. UW professor Ryan Owens expects Garland, described by many as a judicial centrist, would receive bipartisan support under normal circumstances. However, given GOP leaders are still saying they have no plans to vote on a nominee until after the presidential election in November, Owens said he was surprised the president went with a relatively safe pick for the high court. Given that Republicans have not backed down from their argument that the outcome of the next election should dictate the direction of the court, despite seeing some pushback from the public over the position, Owens said he expected the president to name a nominee who might have rallied Democratic voters ahead of next November. “Many people thought he was going to go with another female, or a minority candidate, or potentially a female minority, because that rejections may have gotten, for example, African-Americans out to vote in this next election,” he argued. Owens said he does not see Garland, who was confirmed to the federal bench by the Senate in a bipartisan vote in the 90s, rallying the same kind of support behind him or convincing Republicans to rethink their stance. “I just don’t see him moving the dial very much among Republican senators who are opposed to an Obama selection,” he said. Wisconsin Republicans largely backed up that view on Wednesday, with Sen. Ron Johnson (R-WI) saying he still believes the next president should pick the next justice. Despite not having a vote on the issue, House Speaker Paul Ryan (R-WI) said he supports Senate leadership’s decision not to move forward with the confirmation process until after the election.